*Includes International & South America flights in Chile, Bolivia and Peru. How strong a runner do I need to be? 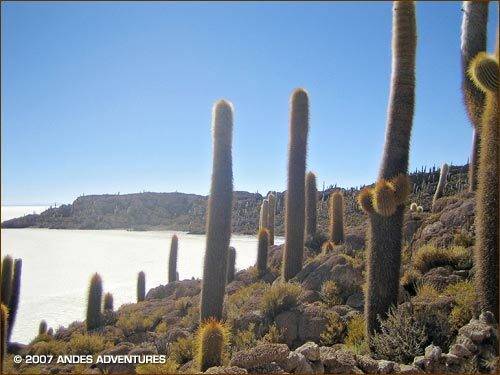 Includes ground transportation in Chile, Bolivia and Perú, quality hotels, all meals, guided tours, and on-trail support. See our FAQ and the detailed itinerary for complete information. 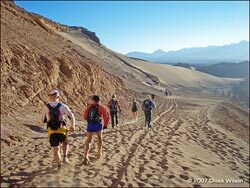 We begin in San Pedro de Atacama - the driest place on earth. 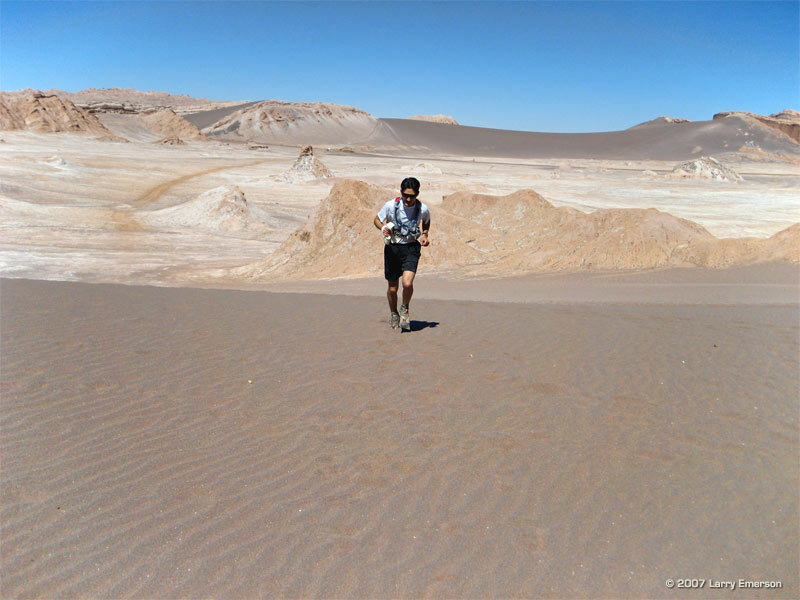 After a day of acclimatization, we run the 'Atacama Marathon.' 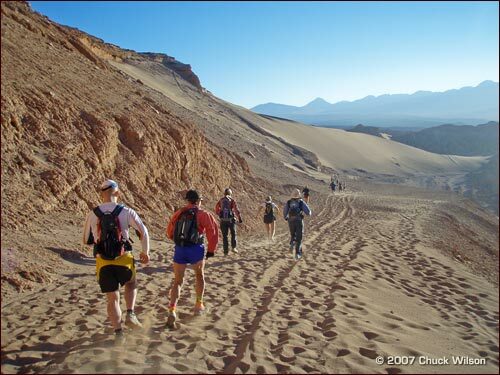 It includes all the best trails around San Pedro de Atacama; runs along Cordillera de la Sal and its magnificent reddish clay and salt mountains, the Valley of Death, Quitor Valley, the Valley of Silence, the Valley of the Moon and the dramatic finish on the Kari Gorge, a narrow canyon formed by water erosion and surrounded by enormous salt walls. We continue to Bolivia, and enter the Eduardo Avaroa National Reserve crossing active geothermal fields, Laguna Colorada and other lakes. We reach the Salar de Uyuni, a 4,700-square-mile area of salt flats reputed to be the largest in the world. Some 40,000 years ago the area was part of Lake Minchin, a gigantic prehistoric lake. When the lake dried it left behind two major salt deserts. The largest one is the Salar de Uyuni. The mineral-rich lakes around the “salar” (salt flats) are breeding grounds for three species of South American flamingos: the Chilean, James’ and Andean. 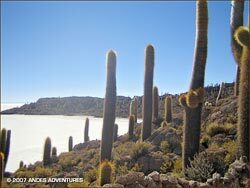 We continue along the altiplano to Uyuni and fly to La Paz. In La Paz we'll see steep cobblestone streets, and remnants of the Inca Empire and the Spanish colonial period. We will enjoy a walking tour of the colonial section, and the San Francisco and Murillo plazas (squares). We drive across the highlands to visit Tiwanacu (also known as Tiahuanaco), and from there continue to Lake Titicaca. At 12,500' (3810 m) Lake Titicaca the highest navigable lake in the world. We arrive in Copacabana on the Bolivian side of the lake. In Inca mythology, Manco Capac and Mama 0cllo, children of the Sun, emerged from the depths of Lake Titicaca to found the Inca Empire. With imposing snow-capped peaks along its far shores, the vast blue lake with its sparkling sapphire waters is one of the Andes' most enchanting scenes. (60% of the lake lies within Perú and 40% in Bolivia). 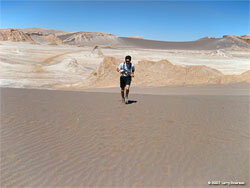 The following day we take a boat to the Island of the Sun to run the "Island of the Sun Marathon". There is also an option to do a shorter run around the Island. We return to Copacabana and continue to Puno on the Perú side of the lake. 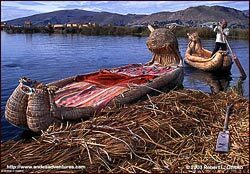 In the afternoon we will visit the "floating islands" of the Uros people  builders of the famous "totora" reed boats. The Uros and other lakeside residents depend extensively on the totora reed. It is used to make fishing boats and homes, as well as the amazing floating islands of reed. We end our journey with a flight from Juliaca – Puno to Lima and connect with our flights home.